DUBAI, United Arab Emirates — The son of slain Washington Post columnist Jamal Khashoggi appeared to acknowledge on Wednesday that financial compensation had been made to the family, but said it did not amount to an admission of guilt by Saudi rulers. Salah Khashoggi described King Salman and Crown Prince Mohammed bin Salman as "guardians to all Saudis." "Acts of generosity and humanity come from the high moral grounds they possess, not admission of guilt or scandal," he said in a statement posted to Twitter. "We, Jamal Khashoggi's family, were brought up by our parents to thank acts of good not disavow." It is not unusual for the king to make so-called "blood money" payments to victims of crimes or accidents in Saudi Arabia. An example of this was the king's pledge to pay thousands of dollars to victims of a 2015 crane crash in Mecca that killed more than 100 pilgrims and injured nearly 400 people days before the start of the hajj. 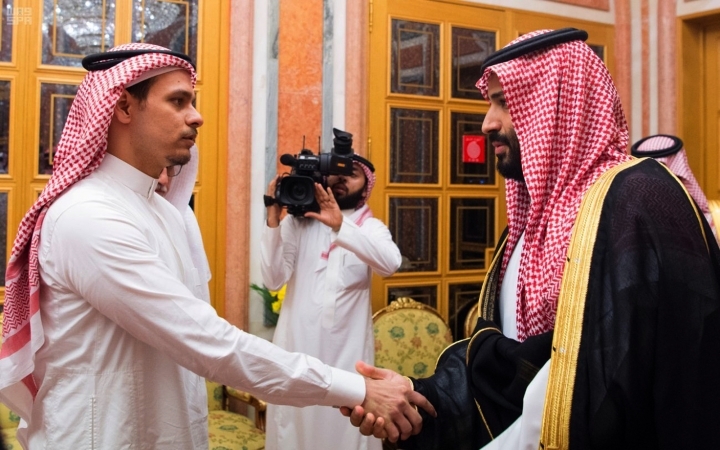 The Post reported that Khashoggi's two sons and two daughters could also receive payouts of tens of millions of dollars each as part of "blood money" negotiations after Saudi Arabia concludes a trial of 11 people charged in connection with the killing, describing the payments as an effort aimed in part at ensuring that the family continues to show restraint in their public statements. The statement by Salah Khashoggi apparently sought to clarify this, saying: "The trial is taking place and no settlement discussion had been or is discussed." "The people who committed and were involved in this crime will all be brought to justice and face punishment," the elder son's statement said. The White House said Trump spoke with Prince Mohammed by phone on Tuesday, and that that they "discussed Saudi Arabia's critical role in ensuring Middle East stability, maintaining maximum pressure against Iran, and the importance of human rights issues."